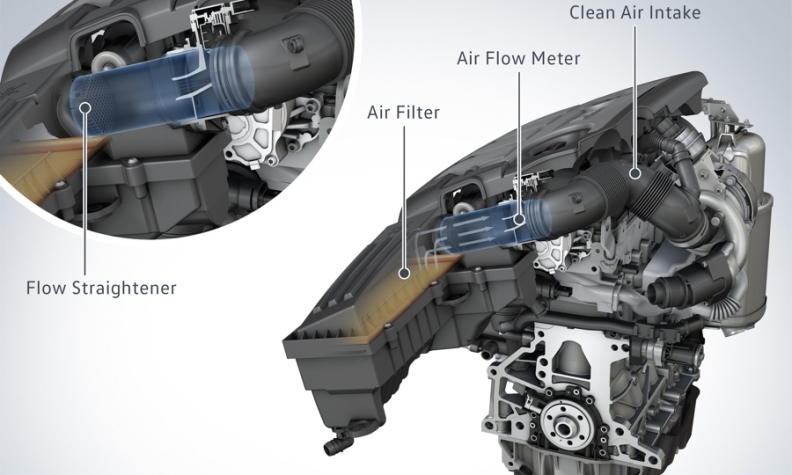 VW says this diagram shows what is needed to fix an emissions problem in its 1.6-liter diesels. Two months into its diesel scandal, Volkswagen says it finally has found a silver-bullet solution. In receiving the blessing of the KBA, Germany's type approval authority, to clean up hazardous emissions from the 1.6-liter diesel, VW has now resolved the hardest aspect of its massive recall as that specific engine required technical modifications. Not only does the proposed new component bring the cars into compliance in Europe, VW Group believes the fix will not even impede fuel efficiency or engine output. Fitted directly in front of the air mass sensor, this part is equipped with a mesh that calms the swirled air flow and thus decisively improves accuracy when measuring current air mass throughput, a very important parameter for optimum combustion. That last passage is taken almost word for word from the company's statement. Pretty darn impressive even if I have absolutely no clue what that means. The component comes complete with a cool name, too – “flow transformer." It sounds kind of like the fictional Flux Capacitor that allowed a DeLorean to travel through time in the 1980s film "Back to the Future." VW even put quotes around the name, as I just did, as if they patented the whole idea in the first place. In German it's even better since you can squish the two words together to form Stroemungstransformator. So imagine my surprise after watching the company's helpful accompanying video on its website (see below). When a bookish-looking VW manager complete with a properly long job title -- head of diesel development of derivatives and fuel injections systems -- explained the merits of said device as he held it up to the camera for all to see, I was stunned. Here is a German engineer who can probably plot the torque and horsepower curves of his engines from memory cradling in both hands a plastic tube as if were pure gold. Low-tech doesn't even begin to describe a part that looks more like something a plumber might install in a kitchen sink to keep it from clogging. Granted, the media had already reported that VW was working on a low-cost solution, but these days something as comparatively complex as DRAM memory chips manufactured under the most stringent cleanroom conditions can cost only a few dollars each. VW still doesn’t have an answer for its U.S. diesels, but can you imagine then how the less-trusting Environmental Protection Agency might react had it, and not the KBA, been confronted with VW's Flux Capacitor? Sorry … “flow transformer." Of course just because it looks cheap doesn’t mean it won’t work. -- I have to assume it does. Volkswagen cannot possibly be dumb enough to announce a fix that doesn't work. They know that environmental advocacy and consumer rights groups won't take them at their word, preferring instead to carry out their own tests to verify the authenticity of VW's claim. There’s no reason a fix should be ludicrously expensive either, but at least retrofitting all engines with completely different injection nozzles as VW Group CEO Matthias Mueller had initially warned might lead one to understand why engineers were not forming lines to be the bearer of bad news. Given that, the implication of the fix is truly staggering. For most of the 8.5 million illegal diesels on European roads, all Volkswagen had to do to ensure it was not breaking the law, polluting the environment or deceiving customers was simply update their software? And for the rest – the 1.6-liter versions that required technical modifications –- a quick run to their local do-it-yourself chain to pick up a plastic drain trap would have sufficed? Total service time required according to VW: less than one hour, if that. It's almost surreal. The whole scandal is beginning to sound more and more like a very, very expensive exercise in tragicomedy.